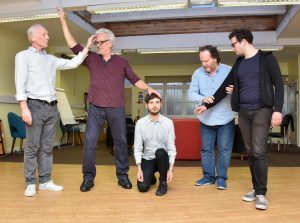 From December 2018 Outside Edge Theatre Company will be available to deliver Drama Taster Sessions for people in recovery at treatment programmes and rehabilitation centres. Two specially trained facilitators with lived experience of substance misuse will travel to your service users and run physical and creative drama exercises. Participants will be led through a physical and vocal warm-up, play improvisation games that build self-confidence and develop healthier ways of narrating their history with substances. These fun, fast-paced Taster Sessions will introduce participants to OETC’s work and the positive impact of using drama to support recovery maintenance. If you are a treatment programme, rehabilitation centre or service user interested in booking one of our Drama Taster Sessions, please contact admin@edgetc.org or call our office at 020 7371 8020. Download our Drama Taster Session Flyer here.